The Creative Ireland Programme is a five year all-of-Government initiative to place creativity at the centre of public policy. It is guided by a vision that every person in Ireland will have the opportunity to realise their full creative potential. Laois Creative Ireland Programme 2019 is currently in progress with lots of exciting and creative projects happening throughout the County. The Laois Culture and Creativity Strategy 2018-2022 is now available to download final full colour CI straTEGY 2018-’22 and details of the 2019 programme will be announced shortly. Cruinniú na nÓg aims to celebrate and encourage children and young people’s participation in culture and creativity through a compelling spread of performances, art and music workshops, and much more. This variety of FREE child-centered events will be activity-based, with plenty of opportunities for children and young people to get ‘doing’, ‘making’ and ‘creating’. The day was a great success with a huge variety of performances, workshops and events for children and young people to enjoy with their families including art workshops, cup cake decorating, shield making, circus skill workshop, along with intercultural dance, drama and music performances. The Dunamaise Arts Centre hosted storytelling, try-an-instrument, drumming circle, dance performances, and a rap workshop. And a rap artist performance on The Gig-Rig on Main Street. A wonderful day of celebration and fun. 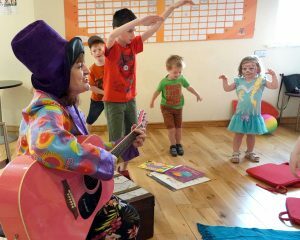 Cruinniu na nOg Portlaoise – Jelly Bean Julie entertains children with her Story telling at Dunamaise Arts Centre . Photo: Michael Scully- no reproduction fee. Laois has set out on a 5 year programme to enhance this dedication to arts access for all by concentrating its projects and initiatives around the core themes of identity, culture, and citizenship. 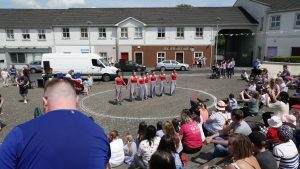 A host of projects and initiatives have taken place or are in progress in 2017, from the Laois County Council Spoken Word Residency to enhancements to the arts programme, library branch events with a focus on crafts and heritage, as well as science, technology, engineering, arts and maths (STEAM), and the digitisation of Laois County Council archives. At the completion of our inaugural year of the Creative Ireland Laois programme, we look forward to forge a plan to deliver the next 4 years of the Creative Ireland Laois programme. Anyone wishing to be involved can contact the Creative Ireland Laois Coordinator, Muireann Ní Chonaill at artsoff@laoiscoco.ie or take part in our online survey currently available. Most recent projects include the Spoken Word Residency, in collaboration with the Dunamaise Arts Centre. Stephen James Smith from Tallaght, Co Dublin was appointed in November as spoken word artist in residence in Laois. He is one of the most well-known modern day poets in Ireland and he has big plans for Laois. His work encompasses the spoken word through poetry and the new digital era of communication. Inspired by the theatre from a young age, James has written a play which toured Ireland, parts of the UK and France. He is well known across the open mic performances nights around Dublin for his poetry, creativity and bringing people together through these kind of events. Despite believing that “poetry is a hard sell”, Stephen is passionate about the art, getting to know Laois and encouraging an appreciation for the spoken in people of all ages in the county and beyond. I feel quite comfortable in that environment and if I could get them on board they might come along to the end event,” he said. Spoken word, a speciality that is developing as an art form and mode of communication, is a very popular outlet for self-expression. Stephen will stimulate greater awareness of the art of the spoken word in Laois as well as encourage more opportunities for young people to engage with the work of established spoken word artists by working with young people throughout second level schools, Youthreach and youth theatre groups in Laois. Stephen’s ambition stretch far beyond engaging with youth groups in Laois. He hopes to get involved with local Men’s Sheds, walking groups, knitting groups and any other groups that would be interested in expression through poetry. The IATD graduate has also requested to run workshops in Portlaoise Prison. It is his goal to leave behind a self-sustaining poetry group in Laois run by local members. He has a great ambition for this group when it is formed to perform at Electric Picnic. He is confident that these goals are achievable. Highlight events in 2017 include Cruinniú na Cásca – To celebrate the first Cruinniú na Cásca, (directly translated as a meeting at Easter) on Easter Monday 2017, a stimulating and enjoyable showcase of young people across various art forms took place in the Dunamaise Arts Centre, Portlaoise. Cruinniú na Cásca was a national day of culture and creativity. The event included performances by children from Senior Infants class in Holy Family School. Over a number of weeks they rehearsed with dance artist Erica Borges, and teacher Jennie Buggy. They were accompanied on stage by teenagers from the Laois Youth Dance Ensemble. Anam Rizwas read a poem by Laois poet, Arthur Broomfield entitled, “After ‘Instruments’ on the James Fintan Lalor Avenue, Portlaoise, A sculptural group by Mary Mc Ginty”. This was followed by a dance entitled Collective Pieces, by the Laois Youth Dance Ensemble. A short film about the background to the Creative Ireland programme was screened also. The second half opened with a rousing performance by guest artist John Spillane and the Music Generation Laois National School Choir, represented by Barnashrone NS and Rath NS accompanied by the talented youth folk group, Lonrach. They performed a selection of Irish songs, The Ratlin’ Bog, and Óró sédo Bheatha Abhaile. John has worked over the last year in Co Laois, bringing Irish songs to a new audience. The tempo was then altered by the JJ Jamers, under the tutelage of Adella Meally, the performed two popular songs, I don’t know my name and Gangsta Paradise. Lonrach along with their tutor Siobhan Buckely performed a selection of tunes including Kevin Ó Loughlin’s, Seoithín Seothó, the First of Winter and Moll and Tierna’s. The afternoon concluded with performer John Spillane singing his own compositions The Dance of the Cherry Tree and 100 Snow White Horses. He was accompanied by the Music Generation Laois National School Choir and Lonrach. 100 Snow White Horses was written while John Spillane was in residence with Music Generation and worked with the Music Generation Laois National School Choir Programe and the 1916 centenary programme. The song is inspired by the folk stories of Laois including the Seven Septs of Laois. An animation was commissioned to accompany the song. This was devised by artist Caroline Conway who worked with Paddock NS and it added hugely to the occasion. The Cruinniú na Cásca event was a joyous occasion and the young performers made the event very special. They had been very well prepared by their teachers. The important feature of the event was the telling of the Laois story in dance, song, music and poetry by young people. Their families and friends at the event were very proud of the young performers. is an independent film documentary currently in production in Portlaoise by Ann Marie Kelly. A group of primary school children from various cultural backgrounds were picked to take part in workshops and armed with the knowledge and stories learned in the workshops they went on to host a family friendly Heritage Trail for Laois Heritage Week. The Trail began at Fitzmaurice Plaza and ended in Dunamaise Theatre with the showing of a short film containing footage from their weekend. They recorded a unique shared experience between the children, their interaction with the various community groups and a one of a kind resource for the town of Portlaoise which captures a snapshot of a town in transition. They provided access to historical sites such as the interior of Fort Protector and Old St. Peter’s Church as well as Dunamaise Theatre where the significance of each site in relation to the foundation of the town was explored with the children. They captured the weekends work on film with a production team who were informed by 2 and half years of research and supervised by experts in the fields of heritage and education. The workshop was led by Pat Boran who was directed by Ann Marie Kelly. The aim is to launch the film in time for consideration for the 2018 film festival circuit with a unique private premiere for the film in Portlaoise town. Protecting our country’s pollinators has never been so important. Laois’s creative approach to the issue can be seen (and heard) in the coming months. There’s nothing nicer than sitting out in the sun, lazily watching bees and butterflies flit between bright petals and long grass. But this spectacle isn’t just for show. It’s a crucial part of our country’s biodiversity. We have 98 species of bees in Ireland and they all do their part to pollinate our gardens and crops. They’re crucial for sustaining our ecosystem, not to mention our economy, and almost all of our bee species are under serious threat. With the help of Creative Ireland, County Laois is taking a creative approach to highlighting the importance and value of pollinators. Composer Ian Wilson is creating a specially commissioned piece for County Laois. Featuring local voices and the sounds of the pollinators themselves, the work is inspired by the natural beauty of the county. The full piece is set for completion in November, and will be performed by saxophonist Cathal Roche at a special performance in the beautiful surroundings of Emo Court during the Leaves Literary Festival. The piece has taken inspiration from the work of the National Biodiversity Data Centre to protect pollinators though the All-Ireland Pollinator Plan, which has also inspired other pollinator actions throughout Co Laois including the Portlaoise Pollinator Party during heritage week which saw artists and ecologists working together to celebrate bees and butterflies in Portlaoise Town’s Green Flag Park. Creative Ireland has strengthened the county library service children’s programmes in 2017 The summer stars reading challenge over the summer months saw over 1200 children taking up the reading initiative. Children’s Book Festival will feature readings from children’s authors Shane Hegarty and Alan Early and a range of other reading related events. . Helen Duggan bests selling author of a “A place called Perfect “ will make a return journey To Laois Libraries for the festival. For Science Week (12 – 19 November) , there will be activities in libraries to engage in science, technology, engineering, arts and maths with children’s Lego and Kite Making workshops. Chess clubs continue in all of the main branches and new members are always welcome. Shared Reading, Do you love poetry and literature, but do not have the time available to join a book club? Do you like the idea of listening to poetry and prose reading and discussing them with a group? ‘Shared Reading’ is a library-based project centred on listening to and discussing literature. if you would be interested in joining our group, participating or listening, please contact the library to sign up. This event begins Thursday, 19 October 1-2pm. As part of the Creative Ireland program, the Library service will continuing to digitise the archives of Laois County Council. A genealogy club has commenced in Portlaoise library and meets every second Thursday of the month in the library. During Heritage week talks on local history and culture were held in Mountrath , Portlaoise , Portarlington and Mountmellick Libraries. An integral part of the Ireland’s Ancient East region and the home of such heritage sites as Castle Durrow, Emo Court and the Rock of Dunamase, Laois is a county that places its rich cultural endowments at the heart of life for all its citizens. As part of its Creative Ireland culture and creativity plan, Laois sets out to enhance this dedication to arts access for all by concentrating its projects and initiatives around the core themes of identity, culture, and citizenship. Laois already boasts a robust arts and library infrastructure which includes such flagship institutions as the Dunamaise Arts Centre – the county’s primary multi-disciplinary performance space – the Laois Arthouse, and the Laois School of Music. In partnership with the Arts Council and Fáilte Ireland, Laois County Council have worked successfully to foster the development, promotion of, and access to the abundance of heritage and cultural spaces contained therein.